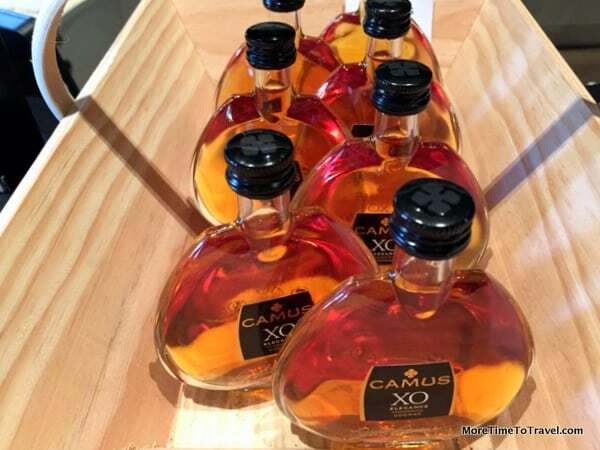 A visit to the House of Camus in Cognac, France affords a one-of-a-kind experience. With its rich history, scenic beauty, and incredible food and wine traditions, it’s not surprising that Bordeaux, France is becoming an increasingly popular tourist destination. On our recent Viking River Cruise through the Bordeaux region, in addition to visiting vineyards and wineries, we took advantage of an optional port excursion to visit the town of Cognac, the only place in the world allowed to produce the type of brandy that bears the same name as the town. This area is second only to the Cote d’Azur in the number of sunny days each year. Along with a group of about 30 fellow passengers, we signed up for a Master Blender workshop at the House of Camus, a venerable cognac producer. The company has been in operation for five generations since 1863 and is the only remaining distillery that is family-owned and independently operated. Upon arriving, our guide Jeanne-Marie told us about the history of the maker and the appellation. The Camus family is the largest landowner in the Cognac Borderies appellation, the smallest of the Grand Crus growing areas. She also explained the process of making cognac, from harvesting to distillation to aging. Then we passed through a series of strikingly attractive museum-like exhibits filling in more details. From there, we were led to a large barrel room with a long table set up on both sides for learning, tasting and blending our own bottle to take home. Measuring cylinders, mixing flasks, funnels and glasses were placed at each setting along with notepads to record our experiences. Our master-blending workshop was led by a very entertaining Master Blender, Frederic Dezauzier, who is also a global ambassador for the brand. Brandies can come from any part of the world but cognac can only be produced in a specific appellation in Cognac. Also, brandy can be made from any type and color of grapes; cognac is only made from three types of white grapes. Distillation is different, too: Brandy can be distilled in different ways; cognac must be distilled twice in a copper pot still. Finally, brandy is aged for at least six months; cognac is aged for at least two years in an oak cask where it achieves its golden color. XO (extra old), which has been stored at least six years. All of them are blends, whose designation is determined by the age of the youngest cognac. A cognac blend, DeZauzier explained, is like a fingerprint. He introduced us to four types of cognac ranging in age from 6-38 years and led us through a tasting that described some of the characteristic tastes, aromas and food pairings. By then, a few members of our group were very happy. Then he left all of us to our own devices to mix a unique blend of cognac that would appeal to our own noses and palates. With little difficulty, my husband found a “perfect blend” that he hopes to sip after dinner (neat). I’ve never enjoyed cognac and this experience, while fascinating and informative, wasn’t long enough for me to develop an “acquired taste” for this luxury libation. We carefully personalized the labels on our 50 cl. XO bottles and recorded the blend in the Camus ledger in case we wanted to re-order it. Each bottle was carefully sealed by an employee in the retail store and packaged in a wooden case to survive the trip home. We were instructed to let the blend sit for at least two months before tasting it. In the meantime, I’m searching for cocktail recipes that will make the taste of mine more enjoyable. Shake ingredients together and pour over crushed ice. Garnish with lemon peel. Disclosure: Our Bordeaux cruise was hosted by Viking River Cruises but any opinions expressed in this post are our own. Fascinating! I’m personally not a big alcohol drinker, but would find this interesting, to know about the history and roots of Cognac. What a cultural tour you had! The experienced was enhanced by the wonderful Master Blender who made history come alive and who could convince anyone, even the reluctant, to taste cognac. I’d love to visit the House of Camus. So interesting to learn all this about Cognac — and of course, have a few tastes. The recipe for Le Parisien sounds and looks very tasty. I’ll have to give it a try. Hope we have the opportunity to drink one together! I’d love to blend my own cognac! What an interesting experience. Your Viking cruise sure offered a lot of fascinating excursions. This was one of three incredible experiential excursions above and beyond the also interesting city tours. The Parisien cocktail looks delish! That would be so cool to make your own cognac. OK, add that to my list of things to do in France! I hope you have the opportunity to visit Bordeaux. I think you would love it. What a wonderful tasting experience and discovery. I would love to explore the area the same way with a luxury experience to boot, hopefully 2016 will be my calling for Bordeaux. Food and spirits offer a window into the culture and history of a place. I think I’ve only tasted cognac once or twice. The experience at House of Camus would be so fascinating and I love the fact that you have your own special blend. Is the family related to the philosopher in any way? It would be so easy to wax philosophical (or simply gossip) with a delicious Le Parisien over crushed ice, wouldn’t it? What an interesting question! I did a quick check of Wikiipedia and it seems as though Camus, the philosopher, was born in Algeria and lived in other parts of France. I don’t know whether the name is a common one in France or whether there is some connection. Food for thought! What a cool place, and the tour looks very comprehensive. BTW, love Viking cruises. Yes, this was a great cruise! We saw and learned so much. Your pictures of the Camus vintage poster and the lovingly preserved, bright red, copper still pot were great! Very interesting and you’ve certainly answered the question of why cognac is considered the best of the brandies. I love tours that combine history and how-to, hands-on experiences and this tour looks like it fits the bill. Some of the best history is to be found in places like Camus and you brought it all to life in this post. Most interesting read, Irene! What a great cruise and the House of Camus and cognac would have been on our list of things to do as well ; ) Loved the Camus vintage poster too. I also wondered if Camus had anything to do with the philosopher, but see a from a comment above that it doesn’t. I had no idea House of Camus gave such a great workshop and you get to blend your own Cognac! What a wonderful souvenir! When I saw House of Camus, I thought it was going to be a tour of the author’s home. Cognac looks like way more fun. It’s certainly an unusual name to us Americans; not sure about Europe. Thanks so much for this! We are taking this very cruise in June, and cannot wait. I was fairly certain that we would want to do this tour, now I am completely convinced. Very interesting reading. Got some new experience about the alcohol making. What fun! Love the bottles – and all the beautiful photos.